God I hate travelling sometimes. For example; now! Why do I need to be in Croatia when this amazing thing is happening in London ! Okay … let me relax… deep breath Ella…. Magnum ice cream! Who doesn’t like Ice cream? If you don’t like it, you are not human and you should return to your planet! 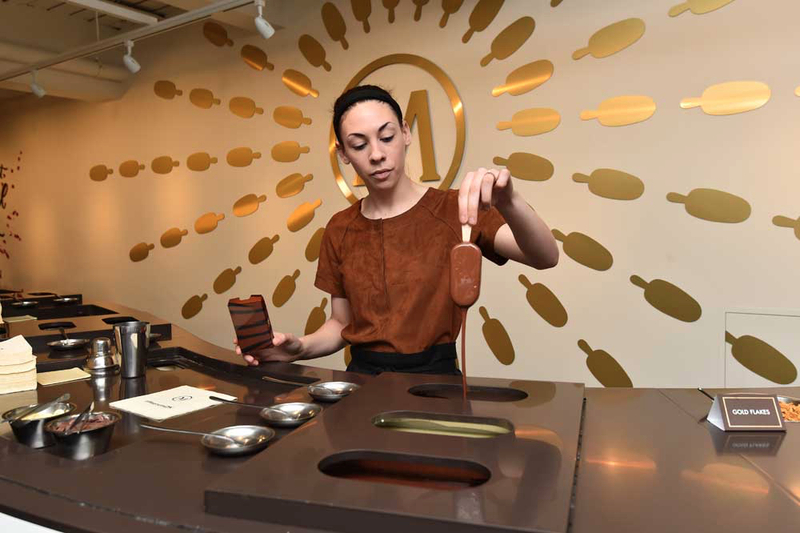 Magnum has opened the Magnum Pleasure Store on South Molton Street in central London. Back by popular demand and open exclusively for the summer, for the first time ever visitors will be treated to freshly double-dipped, personalised Magnums: velvety ice cream, encased in a chocolatey coating, a luxurious layer of peanut butter or chocolate sauce, finally dipped in the deliciously decadent chocolate and a selection of tempting toppings. Bla, bla bla! Go down! Not good enough? Wait! There is more! From black lava sea salt to rose petals, there are thousands of flavour combinations to choose from. Each individual creation will be perfected with a drizzle of chocolate and the finishing touch; a classic M coin decoration. Okay, I am seriously rethinking of booking a flight back to London now. I have never been so excited about a store opening. I mean what do I need to write more to tell you how amazing this is? Look at them! Look at them!!!!! I can’t be there now, but I beg you people, if you are in London, right now, reading this. GO! GO! GO! What are you waiting for? Send me some photos, send me videos, make me feel like I am there with you *cries*. Catch some pokemons on the way too! But most importantly, catch some of these rare magnums!!! Find out more about this store on this link.